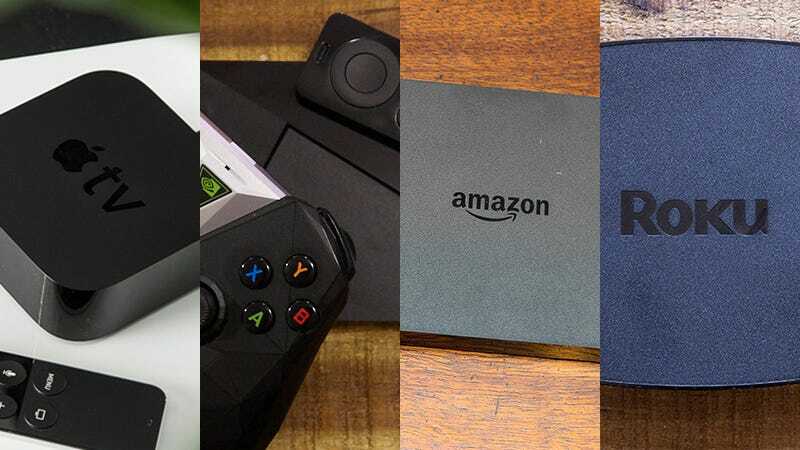 If you’re in the market for a dinky little black box to slide under your living room TV set and pipe through some quality content, you’re in luck: there’s lots of them to pick from. All the major names now have established boxes on the market. While Gizmodo is a big fan of the Roku box and everything it can do, it’s not the only media box in town, and it might not even be the perfect box for you. So instead we compared the four major operating systems running in those boxes to help you sort out exactly which platform will best meet your needs. Whether you’re an Apple loyalist or not, you can’t deny the company makes some stylish-looking software, and tvOS is no exception. In terms of flow, ease of use, and intuitiveness, this is hands-down the best interface out of the ones we tested, it’s also the only choice if you’re full invested in the iTunes ecosystem, as media purchased there can’t be played on non-Apple devices. Part of tvOS’s success as an interface is due to the Touch Remote that comes with any tvOS device. Swiping and tapping and gesturing on it feels just right. The little touches Apple has added—the animations as you move around, the movie-quality screensavers—all help as well. It’s the kind of interface you just want to sit and play with. It helps that there’s stuff to do. While Apple was slow to embrace apps on the set top box, it’s taken no time to build a strong bench of apps you’re familiar with. Though tvOS is still missing some big names, including Spotify. We should also knock it down for being so Apple-focused—getting content up from a Windows or Android device is possible, but not particularly easy. Most of the big video names are present: Netflix, Hulu, YouTube, Vimeo, and HBO Go. Amazon Video is a big miss, but is reportedly on the way later this year. Getting at your Apple movies, TV shows, photos and music is simple too. Gaming support is...not great. We’re a long way from the stage where cool new iOS games automatically appear on the Apple TV at the same time that the launch for the iPhone or iPad. The critically acclaimed puzzlers Lara Croft Go and Hitman Go are available, for example, but they’re the rare top notch titles available. The tvOS also has the rare useful voice assistant—provided you’re looking for something to watch in the iTunes Store. While it will only currently search for media in the iTunes store the voice assistant, Siri, also allows you to fast forward through a video, or rewind and switch on the captions if you missed a line of dialog. All the box OSes we’re reviewing here, except for the Roku, favor their own video and music platforms over those offered by their rivals, and for many users that makes it obvious which one to buy. If all your music was purchased on the Play Store than think about an Android TV, and if it is all from iTunes than you’ll probably prefer an Apple one. It’s one major downside is the lack of 4K, HDR, and UHD support. Most new TVs are 4K and enjoy the higher quality picture HDR and UHD afford, so Apple’s inability to give you the best version of Netflix’s latest show is a major mark in the negative column. Unlike tvOS, Android TV is found on a variety of television sets (including Sony) and boxes (including the Nvidia Shield). For this article we’ve been testing out the Nvidia Shield, showing Android TV in its best light, but the Shield has features (like 4K and HDR support) that might not be available in the Android TV device you’ll find yourself with. The good news is the Android TV interface has gradually found its way to a usable and even vaguely attractive stage: It scrolls well, it’s intelligently laid out, and everything is easy to find. Voice search works well enough, though Android TV pushes you towards Google’s store just as the Apple TV does towards iTunes. All the major video apps are here now, including Amazon Video. Even Spotify has an official app! And there are a number of Android apps that work right out of the box, including web and file browsers. If you’re on the Nvidia Shield the game selection is nearly as good as a console like the PS4 or Xbox One. Nvidia allows streaming directly from the servers so you don’t have to worry about the specs of your local box. But broadly speaking the game options on Android TV seems roughly on par with Apple TV: there are some major names, like Crossy Road, but on the whole developers don’t seem to be rushing to make Android TV versions of their Android games (or indeed their Android apps in general). The voice search functionality, or Google Assistant if you’ve got it, can do basic web queries as well as looking for sci-fi movies or comedy shows, but it’s not as useful as Siri for navigating around inside videos or any extra tricks like that recapping dialog one. Where a tvOS can act as an AirPlay receiver, Android TV turns your box or television set into a Chromecast, which means all that casting goodness is available without the hassle of an extra dongle and an extra power supply. Chromecasting works as well on Android TV as it does anywhere else, so you can get a ton of content from your phone up to the big screen without needing to necessarily install a TV app. Like Android TV, the Amazon Fire TV platform is available on a variety of boxes, sticks and televisions, and which model you pick up is going to determine which features you get, like support for 4K streaming and downloading. The Fire TV has been around for a while now, in one form or another, and while the interface doesn’t quite match up to the slickness of tvOS or Android TV in our eyes, it does the job as well as it needs to. A recent revamp means it’s much more modern-looking than it used to be. Tiles up and down and from left to right with pleasing style, and fades and overlays add to the aesthetic appeal, though as you would expect, Amazon’s own apps are put front and center. As we’ve said before, this is very much a box for Prime members. Apps-wise, you get Amazon’s take on the Google Play App Store, and while Netflix, Amazon Video, Hulu, and some catch-up services are here, you can’t get at content from iTunes, Spotify or Google Play. There’s no proper YouTube app either, though you can install a wrapper for the TV-optimized version of the YouTube website. While Amazon probably wants you to use its boxes as makeshift gaming devices, a good selection of games isn’t on offer. You do get a few titles that are fine for filling a few minutes of spare time, but the big-name titles are few and far between, and here Amazon Fire TV is lagging behind its rivals from Google and Apple. Alexa is now on board these devices, which means you get voice search and everything else that Alexa entails: reading out events from your calendar, checking up on the weather (with a rather nice-looking widget), and pulling up information from the web. You can also use the Alexa voice search through the remote to look for different types of content (with hits from Amazon services shown first), and to control playback while you’re watching movies and shows, Siri-style. Again though it’s going to be of most use if you already use Alexa elsewhere. If you’re a Prime subscriber and a heavy user of Amazon’s music and video services, then the Fire TV boxes or sticks are a decent (and inexpensive buy). For everyone else, it’s difficult to come up with a compelling reason why you would prefer this over something running Apple, Google, or Roku software. It’s lack of support for popular apps is a problem. We’ve long loved the boxes and sticks that Roku has to offer, and the interface is now making its way to a variety of budget smart TVs as well. As with Android TV and Amazon Fire TV, some of the features you get will vary depending on which device you’re running your Roku experience through. Those features make a difference: if you want 4K and HDR, we think the Roku Premiere+ or Roku Ultra are the best set-top boxes you can buy right now, but you don’t get those lovely extras if you’re sticking with a Roku stick. Adjust your expectations accordingly. Roku has always excelled at the number of services it supports, and new ones are still being added. Just about every service out there, except for Apple’s digital stores, have a Roku app to make use of, so whether you’re tuning in with Netflix, Hulu, Plex, Google Play Movies & TV or anything else, it’s a cord-cutters dream. Outside of the entertainment apps, Roku doesn’t quite offer the same breadth of choice as the other platforms we’ve discussed above—the selection of games is pretty meagre, for example—but there are some nice surprises to be found, like the Firefox browser. Roku doesn’t have a voice assistant to call its own, but you can search using your voice through the remote or the mobile apps, and we found it to be responsive and smart. Most importantly, it covers all the apps you’ve got installed, and the feed idea, which automatically populates with media you’ve followed or previously shown an interest in, is a masterstroke as well. Considering Roku devices are so capable and so well priced, there’s not much to talk about in terms of negatives, but the dated-looking UI is one of them. It feels staid and sluggish compared with the software Google, Apple, and Amazon are putting out right now, and the apps themselves don’t seem to get much developer love either. A slightly old-fashioned interface isn’t the biggest dealbreaker, but it feels like Roku could use a visual refresh everywhere from its software to its chunky remote. Some extra tricks, like in-app voice control and the ability to quickly refine searches, would be welcome improvements too. Roku’s independence from Apple, Google, and Amazon remains its main advantage, and if you hop between devices and platforms then it makes sense to have a Roku as your media streaming box of choice (though of course getting anything from iTunes requires an Apple-branded box). On the downside, you don’t get any Airplaying or Chromecasting capabilities, and there’s not the broad developer support you find with tvOS or Android. If Roku wants to remain the go-to streaming device brand it’s become, there’s lots of hard work ahead.